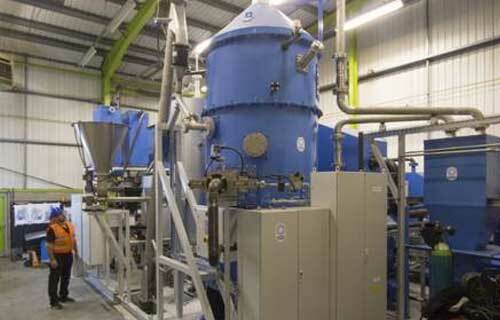 Recycling Technologies is industrializing a process to convert residual plastic waste into its Plaxx fuel. In the European Union alone, more than 25 million metric tons of postconsumer waste plastic is produced each year. Of this huge quantity of material, only 26 percent is recycled, with 36 percent going for incineration, while the remaining 38 percent contributes to the ever expanding problem of landfill. In addition to the loss of its material value, the carbon cost of processing this mixed waste is considerable, not least due to transportation, as many regions and states export their mixed plastic waste due to a lack of localized processing facilities. 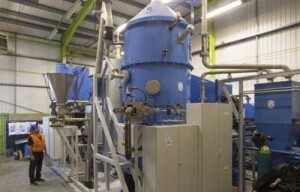 To help address this global issue, Recycling Technologies has developed a machine (RT7000) and is industrializing a process to convert residual plastic waste into a low sulphur hydrocarbon compound known as Plaxx. This can be used as a petrochemical feedstock, a manufacturing commodity such as paraffin wax, or as a clean and more sustainable fuel substitute for fossil-based HFO, which also displaces imported oil. In the project announced today, Ricardo will work with Recycling Technologies to assess the relative performance of Plaxx, HFO and diesel when used in an engine of the type and scale typical of power generation or marine propulsion applications. The Ricardo Atlas II research engine will be used for this work: this advanced test engine is capable of efficiently evaluating the performance of fuels in large, multi-cylinder engine designs ranging from 150-200 mm bore and representing engines in the class 0.5 to 5 MW, in a single power cylinder. This can result in a reduction exceeding 90 percent of the test fuel consumed in a typical research or development project. In the early stages of the Recycling Technologies project, a thorough review of the properties of Plaxx as a combustion engine fuel will be carried out in order that a comprehensive test plan can be developed. Back-to-back testing of Plaxx against diesel and HFO will then be undertaken over a range of loads using the Atlas II engine. Combustion characterisation will also be trialled based on the measured in-cylinder pressure, power, specific fuel consumption and exhaust emissions. This will help to fully understand the behaviour of Plaxx in this type of engine and enable the further refinement of engine and fuel settings for maximum efficiency and low emissions. Recycling Technologies has funded R&D projects through various government funding organization’s, including the Knowledge Transfer Partnerships (KTP) and the Energy Catalyst grant with the University of West England (UWE), funded by Innovate UK. There has been additional support from other government funding organizations, such as the Department of Energy and Climate Change (DECC) and the Department for Business Innovation and Skills.